There’s an old adage about ‘paying for the view,’ and it’s literally true at this St. Thomas attraction where you take a cable car to a point 800 feet above the Charlotte Amalie harbor. Even on a rainy day, the vistas were outstanding: the cars feature bigger windows than you’d find on a typical ski lift, so you get a pretty good view even as you and transported up and down the mountain. Once you arrive at Paradise Point, you’ll enjoy a sweeping vantage point that takes in downtown, the harbor, Hassell and Water islands, and, on a good day, several of the British Virgin Islands and even Puerto Rico in the distance. Conveniently, some of the best views can be found at the summit restaurant, home to the original Bailey’s Bushwacker, a surprisingly potent frozen cocktail reasonably priced at $7.50. On a sunny day, this would be a nice spot to relax over a long lunch and some cold drinks. On a drizzly Thursday afternoon, however, Paradise Point was pretty dead. The $21 per person admission fee gave us all day access (9 a.m. to 10 p.m.) to the skyride plus a free ride on the small ferris wheel at the top, but it was too wet for us to try. Ditto for the bungee-jump attraction nearby. We were tempted to come back at night, however, when the ferry wheel is lit up and becomes a familiar landmark to Charlotte Amalie visitors. A few small shops sold the usual tourist trinkets and clothing. There’s a short boardwalk leading to a nature trail, as well, but a series of cages intended to display local wildlife were mostly empty on the day we visited save for a few parrots and parakeets. There were a couple of geese and goats who pestered us for food, so we obliged with some bits from a granola bar. Other than that, however, we had the trail -- which leads to an overlook where you can see the island of St. Croix -- to ourselves. Advertising for the skyride (“It’s Carnival all day, every day”) boasts of masquerade dancers, daily crab races, and live music -- we saw a stage, but none of the entertainment. On Wednesdays, Fridays, and Saturdays -- the big port days for Charlotte Amalie -- Paradise Point stays open till 2 a.m., and while in most cases I’d recommend against going places where all the cruise-ship passengers flock, Paradise Point is an exception: I suspect that this place is a lot livelier -- with more of the promised entertainment -- when it’s packed with some of the thousands of cruisers who hit town those days. 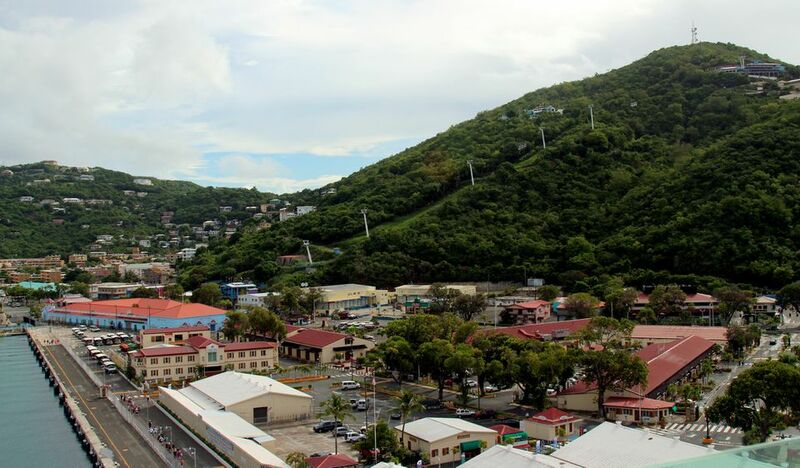 If the scene isn't quite as hopping as you'd like, there's plenty to do in downtown Charlotte Amalie, including within walking distance of the skyride. If you're so inclined, the St. Thomas branch of the Hooters restaurant chain is right next door, while the Havensight Mall across the street has Senor Frogs and the Delly Deck, a longtime St. Thomas hangout. The Tap & Still Havensight has a casual food and dancing with live DJs, and Shipwreck Tavern, known for its burgers and live music, is just a few blocks south.